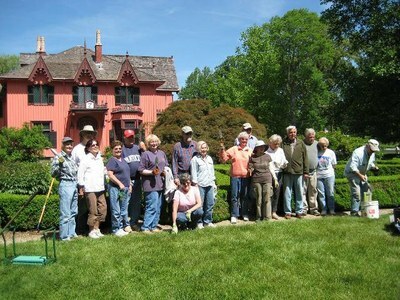 On Tuesday, May 25, twenty volunteers and a handful of staff started planting approximately 3,500 annuals in Roseland Cottage’s twenty-one-bed formal parterre garden. Planting continued throughout the week until all of the geraniums, heliotropes, cosmos, salvias, calendulas, and more were planted. The varieties of annuals added to the garden follow the Bowen family’s original plant order in 1850. Staying true to nineteenth-century garden plans, volunteers planted the masses of annuals in ribbons and solid blocks of color, a technique known a carpet bedding, to create beautiful patterns of color. The gardens look beautiful, thanks to our local volunteers.